True Indoor Bonsai™ are the most successful gift bonsai for anyone, anywhere who can grow houseplants! These unique, premium plants are grown on the Big Island of Hawaii by Fuku-Bonsai, the pioneer of True Indoor Bonsai™ since 1962. 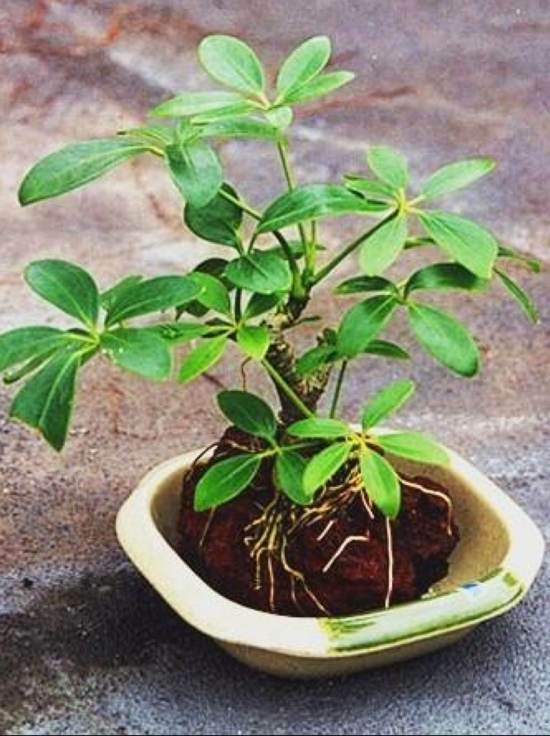 Specially grown, long-lived Dwarf Schefflera are the ideal and most durable of all houseplants for bonsai. Hawaiian Lava Plantings are very easy-care. Indoors soak in water once per week for thirty minutes. White roots mean all is well. Do not over-water. They can be grown outdoors in shady areas when night temperatures are above 55°F if watered more frequently. Includes cultural information and a supply of Nutrient Granules. Fuku-Bonsai's True Indoor Bonsai™ are unique, premium, easy-care gifts grown in a Hawaii-certified nursery for shipping to all parts of the United States. It blends an attractive, sculptured, porous lava rock with a durable pre-trained plant to bring you enjoyment for many years. Small size Dwarf Schefflera Lava Planting with melamine display dish. 5"-7" tall; 3.5" rock; 3-5 years in training. Up to 6 lava plantings. Free shipping included.